Sam Griffiths on Paulank Brockagh and Michael Jung on fischerRocana FST have both withdrawn from the WEG. Photos by Lindsay Berreth and Kimberly Loushin. Two top contenders in eventing have withdrawn from the 2018 FEI World Equestrian Games, held in Mill Spring, North Carolina, Sept. 11-23. 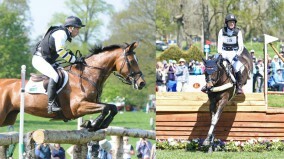 Michael Jung’s fischerRocana FST (Germany) and Sam Griffiths’ Paulank Brockagh (Australia) both withdrew due to injury. “With a heavy heart, we must inform [you] that fischerRocana has contracted a compression of the front left fetlock during training,” Jung posted on his Facebook. “According to the veterinarian, it is a minor injury, but it takes time. Unfortunately, this time is too short until the departure, and we could not complete the last training sessions. That’s why we [will not] start in Tryon. With Jung out, reigning world champion Sandra Auffarth will be called up with 9-year-old Selle Français Viamant du Matz. Emma McNab will replace Griffiths on her 10-year-old Irish Sport Horse Fernhill Tobasco.